A driver has died leaving many others seriously injured after FRSC officials pursued his car into a ditch. 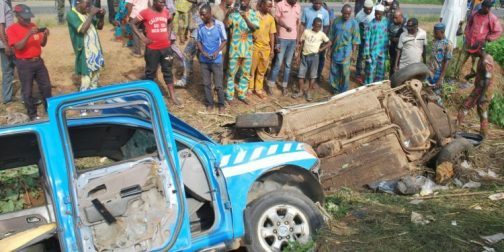 One person was confirmed dead while four others were critically injured on Friday after a Federal Road Safety Corps (FRSC) van chased a taxi driver into a ditch along the Oyo-Ibadan Express road, according to a report by PM News. The taxi driver, Akeem Ibrahim, died while four others injured were rushed to the hospital. The FRSC officials escaped. The FRSC Hilux van with code No. 1139(3) was reported to have been in pursuit of presumed road traffic defaulters in a Nissan Micra vehicle with registration No. Lagos KSF 831. However, while speaking with a news correspondent on Saturday in Ibadan, Mr Seun Onijala, Oyo State FRSC Corps Education Officer, denied that any one died in the accident. He said the accident involved six persons and three persons were injured while the remaining three persons were unhurt. “Nobody died in the accident and I am telling you the true picture of what happened. “The officials asked the Micra car to stop and the driver refused to do so and decided to turn the wheel of the car to the officials at the right and left side of the road with the aim of knocking them down. “The FRSC officials were able to move away to the other side of road and the driver of the Micra car moved on and the patrol team van gave the Micra car a chase. “In the process of the chase, a trailer was coming on the one way of the road and the option for the Micra car and the FRSC Van was either to both have a head-on–collision with the trailer or fell into the wide hole by the roadside,’’ Onijala said. He said that both the Micra car and the patrol team van plunged into the wide hole by the roadside and three persons were injured and the remaining three were unhurt but nobody died in the accident. Onijala said the command had always warned its officers not to chase any vehicle that committed an offence but to leave them and get their plate number to apprehend and punish them later.